The following is part II of II of a meticulously documented article being reprinted here with permission of the Mormon author, Robert A Rees, Phd. It was originally published at Sunstone Magazine, an online publication of Mormons. "Sunstone brings together traditional and non-traditional Latter-day Saints, promoting an atmosphere that values faith, intellectual and experiential integrity. Sunstone is an independent organization, and does not have any official ties to The Church of Jesus Christ of Latter-day Saints." You can turn on the television and see people who claim expertise that they don’t possess. And I say that, because the kind of expertise we need is not a facile grasp of policy, but a love of humanity. That’s what we need. • Claiming Obama is “letting our troops literally bleed and die” in Afghanistan, Beck suggests he will “pay for it” in the afterlife. Beck: Senator, do you believe—I mean, when I heard Barack Obama talk about the Constitution and I thought, we are at the point or we are very near the point where our Constitution is hanging by a thread. Hatch: You got that right . . .
• Walk and talk in the manner of love; for God is love. • Observe with friend and foes the ordinary rules of courtesy. Though Beck tries to wrap himself in the mantles of Gandhi and King, his behavior, like that of his followers, is far from the principled actions of such non-violent leaders. If, indeed, Mormon elders are ever called on to save the Constitution, it will not be because they are partisan, political, or powerful, but because they will act on principles of righteousness—humility, mercy, forgiveness, long-suffering, and love. Vickers’ recommendations are hardly disinterested since he is the chief investment officer of Nine Points Investment62 and, like Goldline, one of Beck’s corporate sponsors, promotes investing in gold as a hedge against the coming economic and social collapse. Beck seems to be applying a rigid litmus test for politicians. In this he resembles other resurgent purists on the right. As the New York Times reports, “Tea Party movement and advocacy groups on the right are demanding that candidates hew strictly to their ideological standards and are moving aggressively to cast out those they deem to have strayed, even if only by participating in the compromises of legislating.”77 Beck contributes to, rather than diminishes, the polarization presently plaguing our society. This is the one cause that ranks above all others in bringing about the social justice so much desired in governments. Watching this, I thought, “Is he totally unaware that social and economic justice are woven into the fabric not only of American history but of the gospel itself? Does he not know a group of active Latter-day Saints has formed an organization called Mormons for Equality and Social Justice?81 I was not surprised to see a tremendous backlash to Beck’s words from everywhere—the left, center, and right. Jim Wallis, a respected Christian writer and social justice advocate, said in “An Open Letter to Glenn Beck: Social Justice and the Gospel,” “Perhaps you don’t realize that most Christians believe social, economic, and racial justice are at the heart of the gospel, not a perversion of it.”82 In another article, “Biblical Social Justice and Glenn Beck,” Wallis added, “The Bible is clear: from the Mosaic law of Jubilee, to the Hebrew prophets, to Jesus Christ, social justice is an integral part of God’s plan for humanity.” Wallis called on Christians who believe that social justice is an expression of their faith to “send [Beck] thousands of names.”83 As of April 2010, more than fifty thousand believers from many denominations had responded. From the beginning, The Church of Jesus Christ of Latter-day Saints has been committed to social justice, a principle supported by ancient and modern scriptures and prophets. The Church has always taught that working for social justice is the responsibility not only of individuals, churches, and organizations, but also of governments, although Beck often tries to make a contrary distinction: “I want to make this clear: Some people look at social justice as going out on mission[s] and going out and doing good works for God. That’s great—as long as it’s Jesus and the church or your synagogue or whoever it is who you are serving, not a government-bloated program.”92 How diminished social justice would be without the actions of local, state, and national governments and joint-national organizations such as the United Nations. Doubtless for some Mormons, such language confirms that Beck is inspired, that he is called to be God’s prophetic voice to a fallen America, and the one (or at least one of the ones) to save the Constitution. 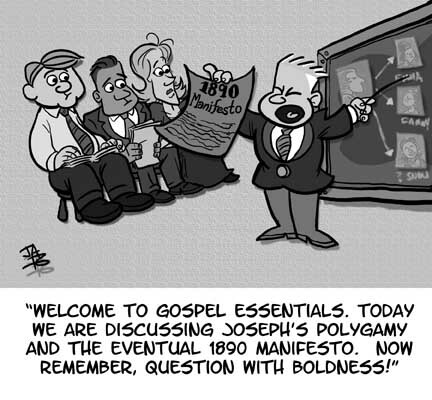 Other Latter-day Saints are disturbed by such language because they distrust a divisive and polarizing spokesman and because they’ve been taught that if such a plan were to be revealed, it would be to the Prophet, not to a Fox television commentator. Responding to criticism of his comment in Forbes (“I got all kinds of heat for telling Forbes magazine my company is an entertainment company, but only after they printed half of the quote from that conversation”), Beck launched into his shape-shifting revisionist mode: “My company is an entertainment company, but now I find myself in the position that I believe my country is on fire. . . . The reason I tell you this is because I believe our lives are about to change. . . . I find myself talking more and more about God these days because that’s where our solution lies.”101 In other words, if people see Beck as just an entertainer, then they may stop listening to and watching his programs and stop buying his products. If we are to understand that the whisperings of the Spirit, the “call” to save the Republic, and the family council’s decision to courageously accept opprobrium had transformed Beck from clownish entertainer into a sober prophet, the programs broadcast since that supposed turning point offer no evidence of it. Beck continues to cultivate his sardonic sideshow persona: criticizing the President, demonizing progressives, castigating his critics, mocking everyone on “the Left,” lampooning those who disagree with him, moving photos around on his blackboard in a flurry of fury to unmask the conspiracy he sees as a cancer on the body politic.103 Beck seems as unrepentant and out of control as ever. I wonder if he is even able to stop himself. The problem for Mormons is that Beck is unlikely to change his aggressive, bombastic, confrontational style or to be deterred from his self-appointed mission to rescue the nation and set the world aright. Since Beck is a recovering alcohol and cocaine addict, one might propose that he has replaced substance abuse with the adrenaline rush of celebrity and notoriety. Having grown up in a family of addicts, I recognize some of the signs in his behavior. Another reason Beck is unlikely to change tactics is that they have made him fabulously wealthy, earning him an estimated $32 million in the twelve months between February 2008 and March 2009,106 thus making him one of the most highly paid people in the political/publishing/entertainment industry. Although much he does and says seems at variance with his new-found religion, Beck is unlikely to surrender his fame and fortune or modify his style in any way that would diminish his colossal media power. Beck has become such a giant on the entertainment/media landscape that he cannot help impacting the Church and its central missions. Many of Beck’s non-Mormon followers, who include evangelicals and fundamentalists, may have difficulty reconciling their devotion to him with his religion. Yet some may be willing to overlook his being Mormon because of their fervor for the cause he represents. Because of the Church’s past history of racism, its recent involvement in Proposition 8, its connection in the public mind with Mormon fundamentalists, and its general conservatism, the moderate-to-liberal populace may see Beck as confirmation of what they are already convinced is Mormonism’s extremism. Thus Beck’s identification with Mormonism could hardly be positive for the Church. Instead of reflecting the messages of the New Testament, the Book of Mormon, and the more enlightened teachings of the Restoration, Beck has latched on to some of the worst ideas from the Mormon fringe to shape his political and social persona. Where in Beck’s universe do we find the messages of the Sermon on the Mount, King Benjamin’s address, or the 121st section of the Doctrine and Covenants? Where are the long-held Latter-day Saint principles of respect for civil authorities? Has Beck read the 134th section of the Doctrine and Covenants which states, “We believe that all men are bound to sustain and uphold the respective governments in which they reside. . . . We believe that every man should be honored in his station, rulers and magistrates as such”? (D&C 134:4–5) There is a dramatic disconnect between these texts and the critical, pejorative, mean-spirited labeling, name calling and demonizing characteristic of much of Beck’s broadcasts and writing. The extent to which Beck and Mormons can be identified with virulent right-wing hate groups is seen in a video posted online by AmericaForever.com, a Utah-based super patriotic, anti-homosexual, anti-government organization. The video, called “Obama Killer Song,” which sets new words to the Paul Simon song, “The Sounds of Silence,” shows a figure wearing a mask of President Obama strangling an old woman in her sleep, stabbing a pregnant woman in the stomach, hanging a CIA agent, brain-washing children, stealing money from taxpayers, cross-dressing, shooting Representative Joe Wilson with an assault rifle, and forming a shadow army. Three times in the video there is a cut to Beck’s TV program.113 Beck likely had nothing directly to do with the video, but his ideological fingerprints are all over it. Beck’s Mormon conversion seems genuine and appears to have profoundly impacted his and his family’s life. Apparently, he serves faithfully in his ward as a priesthood instructor, ward missionary, and—with his wife—in the Church’s addiction counseling program. I understand he holds a temple recommend and, one would guess, pays a gargantuan tithing. However, the difference between Beck’s Sunday demeanor and his weekday media personality makes him a Mormon Dr. Jekyll and Mr. Hyde, which may portend trouble for the Mormon community and beyond since religious incoherence (or, worse, hypocrisy) does not engender trust or confidence. When Beck takes positions such as denying global warming and warning viewers against having their children vaccinated for swine flu, when he indicates that he doesn’t believe in evolution and says he refuses to complete the required information on the Census survey (contrary to the First Presidency’s specific directions that Latter-day Saints should complete the survey114), he risks endangering those who accept his positions as enlightened. Were I called to counsel Beck, I would urge him to be more temperate in his expressions, more moderate in his style, more sensitive to the ways his positions and language might affect others and the Church itself. I would also counsel him to be more attuned to political and social diversity within the Church and the culture at large. I would ask him to be more respectful of our leaders, including those in government, treating them the way Beck himself would like to be treated. I would encourage him to read more broadly than he apparently has; in addition to the scriptures and the writings of General Authorities, I would suggest that he read Mormon writers such as Lowell Bennion, Eugene England, Terry Tempest Williams, Claudia Bushman, Levi Peterson, and Margaret Young. I would also recommend he rely on more reputable and mainstream historians than Skousen and the like, read the best books from other spiritual traditions, and good novels and poems as well. In brief, I would like the more expansive, compassionate, and inclusive voices among us to be part of his regular reading fare. Most of all, I would encourage him to read deeply and thoughtfully the words of Nephi, King Benjamin, Alma, Moroni, Joseph Smith and, especially, Jesus. I would hope he would take such counsel into his heart. As usual, Beck stirred up a witches’ brew of photos, film clips, and diagrams to warn his audience of threatening conspiracies: “The free ride our grandparents gave us—it’s all over! Our rights are slipping away. They are trying to squash free speech through mockery, intimidation of advertisers, the Internet, any way they can.” He warned his viewers that they are the target of the administration’s nefarious campaign: “They think you’re dangerous . . . They want to teach you a lesson . . . They want to convince you that you can’t make a difference . . . They want you to believe that your vote doesn’t matter, that your voice doesn’t matter. They want to silence your speech by silencing my speech.” Positioning himself on the side of the angels, Beck pointed to three, large, captioned photos referred to earlier (Samuel Adams—”Faith”; Washington—”Hope”; Franklin—”Charity”). “This is about the Founders,” he intoned. “It’s about the Constitution, it’s about our country and our children.” Indeed it is, Brother Beck; indeed it is. When I began my study of Beck, I regarded him as a comic curiosity. The more I have listened, watched, and read from his books, the more my attitude has shifted from curiosity to concern. The more I have learned about Beck’s life story, the trajectory of his professional career, his conversion to Mormonism, and his gravitation toward the extremes of Mormon and American culture, coupled with his growing popularity, the more my concern has turned to alarm. Instead of being just another charismatic, wacky, out-of-control entertainer or news personality, Beck has evolved into a dangerous figure. I find it difficult to reconcile his values and his behavior with the Church to which we both profess allegiance. I suspect that many fellow Mormons will be displeased by what I have written here. I ask them to consider how they would feel were a powerful, prominent radio and television host to be as critical of President Monson or Mitt Romney as Beck has been of President Obama. Should Romney run for the presidency again, as most people assume, he will get his share—perhaps more than his share—of negative publicity. Some will distort his record and disseminate misinformation about his religion. Should he eventually become president, I hope he would not be subject to the kind of savage criticism and personal attacks Glenn Beck has unleashed on President Obama. In writing this article, I have been aware of constant tension between my wish to be fair to Beck as a human being and fellow Latter-day Saint and my concern for the damage I feel he is doing and will likely continue to do to the country and the Church. Endowed Latter-day Saints make a covenant in the temple not to “speak evil of the Lord’s anointed.” While most Latter-day Saints tend to understand this charge as referring exclusively to General Authorities, like Titus who admonished, “Speak evil of no man” (Titus 3:2), I feel it refers to all who have been anointed by the mercy and grace of God. And for me, that includes Brother Glenn Beck. 1. “Sunbeams,” The Sun, December 2009, 48.
ministry.com/review-bonhoeffer-life.html (accessed 9 May 2010). 322101900945 (accessed 7 March 2010). 4. Robert Byrd, letter to the editor, Charleston Daily Mail, http://www.dailymail.com/Opinion/LetterstotheEditor/201003030609 (accessed 7 March 2010). politics/war_room/2009/03/17/beck/ (accessed 18 Dec 2009); Mike Bates, “Former Fox News Host Rips Glenn Beck, Kicks Fox,” Newsbusters, 5 December 2009, http://newsbusters.org/blogs/mike-bates/2009/12/05/former-fox-news-host-rips-glenn-beck-kicks-fox (accessed 18 Dec 2009). 2010/05/18/glenn-beck-hits-2010-rati_n_580440.html (accessed 20 May 2010). news/ni1466752/ (accessed 8 May 2010). online/glenn-beck-almost-as-admired-as-nelson-mandela/ (accessed 2 April 2010). time/specials/packages/article/0,28804,1984685_1984864_1985415,00.html (accessed 29 April 2010). 10. Lacey Rose, “Glenn Beck Inc.,” Forbes, April 26, 2010; http://www.forbes.com/forbes/2010/0426/entertainment-fox-news-simon-schuster-glenn-beck-inc.html (accessed 8 May 2010). star.org/fair-and-balanced-glenn-beck-part-2/comment-page-1/#comment-46107 (accessed 5 March 2010). glenn-beck-cleon-skousen-am (accessed 5 March 2010). 13. Joanna Brooks, “How Mormonism Built Glenn Beck,” Religion Dispatches, October 7, 2009, http://www.religiondispatches.org/archive/politics/1885/how_mormonism_built_glenn_beck (accessed 8 March 2010). Mormon lore about the Founding Fathers is reflected in an 1877 vision of President Wilford Woodruff that prompted him to be baptized by proxy for the signers of the Declaration of Independence. In his last conference address, Woodruff recounted George Washington’s words to him in this dream/vision: “We laid the foundation of the government you now enjoy, and we never apostatized from it, but we remained true to it and were faithful to God.” Thus Beck’s identifying with the Founding Fathers is something that many Mormons identify with. See “Wilford Woodruff’s Final General Conference Talk as LDS Church President,” Moroni’s Latter-day Saint Page, http://www.moroni10.com/General_Conference/Wilford_Woodruff_Final_Talk.html (accessed 8 May 2010). 14. http://www.millennialstar.org/fair-and-balanced-glenn-beck-part-2/; (accessed 8 May 2010). talk/blogs/jason_echols/2009/10/mormon-like-me-black-saints-bi.php (accessed 8 May 2010). 17. Alexander Zaitchik,”Meet the Man Who Changed Glenn Beck’s Life,” Salon, 16 Sept. 2009, www.salon.com/news/feature/2009/09/16/beck_skousen (accessed 8 May 2010). 19. Foreword to W. Cleon Skousen, The Five Thousand Year Leap: 28 Great Ideas that Changed the World 30th Anniversary Edition (Franklin, TN: American Documents Publishing, 2009), 6.
an-open-letter-to-latter-day-saint-detractors-of-w-cleon-skousen-and-his-works (accessed 14 March 2010). 22. Sam Antonio, a national spokesman for the John Birch Society, on the 25 July 2007; “The Glenn Beck Chart,” Media Matters for America, 19 October 2009, http://mediamatters.org/research/200910190048 (accessed 8 May 2010). news/politics/war_room/2009/03/17/beck (accessed 2 April 2010). 24. Gregory A. Prince and Wm. Robert Wright, David O. McKay and the Rise of Modern Mormonism (Salt Lake City Utah: University of Utah Press, 2005), 290. 27. “Obi wan kolobi,” “Mormonism and Conspiracy Theories, From Behind the Zion Curtain,” 11 October 2007, http://frombehindthezioncurtain.blogspot.com/2007/10/mormonism-and-conspiracy-theories.html (accessed 5 March 2010). N._Welch (accessed 22 May 2010). 10sep10,0,2241894.story (accessed 8 March 2010). 30. Steve Benen, “Looking Lovingly to Joe McCarthy,” Washington Monthly, 12 March 2010, http://www.washingtonmonthly.com/archives/individual/2010_03/022823.php (accessed 11 April 2010). 31. “A Conversation with Senator Arthur V. Watkins,” Dialogue: A Journal of Mormon Thought vol. 3, no. 4 (1968), 115. 32. Ibid., 116. The opposition Watkins experienced is similar to that faced by Senator Bob Bennett in his quest for reelection. 33. “McCarthyism,” Wikipedia, http://en.wikipedia.org/wiki/McCarthyism (accessed 12 March 2010). 34. See “Benson and the John Birch Society,” in Gregory A. Prince and Wm. Robert Wright, David O. McKay and the Rise of Modern Mormonism (Salt Lake City: University of Utah Press, 2005) 286-295. 35. Ronald Feinman, “Glenn Beck: The Most Dangerous Demagogue Since George Wallace!” The Progressive Professor, 4 January 2010, www.theprogressiveprofessor.com/?p=10775 (accessed 17 April 2010). 37. Scott Horton, “The Heirs of Father Coughlin,” Harper’s, 17 March 2009, http://www.harpers.org/archive/2009/03/hbc-90004568 (accessed 2 April 2010). 39. “Glenn Beck, Obama Is a Racist,” CBS News, 29 July 2009, http://www.cbsnews.com/stories/2009/07/29/politics/main5195604.shtml, (accessed 7 March 2010). 40. “CNN’s Beck to First-ever Muslim Congressman: ‘[W]hat I feel like saying is, ‘Sir, prove to me that you are not working with our enemies,’” Media Matters for America, 15 November 2006, http://mediamatters.org/mmtv/200611150004 (accessed 7 March 2010). 41. Kate Zernike and Megan Thee-Brenan, “Poll Finds Tea Party Backers Wealthier and More Educated,” New York Times, 14 April 2010, http://www.nytimes.com/2010/04/15/us/politics/15poll.html (accessed 14 April 2010); Charles M. Blow, “Trying to Outrun Race,” New York Times, 8 May 2010, http://www.nytimes.com/2010/05/08/opinion/08blow.html (accessed 24 May 2010); Brendan Nyhan, “Disturbing Poll on Beliefs about Obama’s Birth,” Pollster, 31 July 2009, http://www.pollster.com/blogs/disturbing_poll_on_beliefs_abo.php (accessed 16 April 2010); Robert Schlesinger, “Party of Nuts: Poll Shows GOP Thinks Obama is Muslim, Socialist,” U.S. News and World Report, 24 March 2010, http://www.usnews.com/blogs/robert-schlesinger/2010/03/24/party-of-nuts-poll-shows-gop-thinks-obama-is-muslim-socialist.html (accessed 14 April 2010). 42. http://thinkexist.com/quotes/with/keyword/civility/ (accessed 22 May 2010). 04302010/transcript5.html (accessed 7 May 2010). post.com/wp-dyn/content/article/2009/11/29/AR2009112902014.html (accessed 6 April 2010). www.forbes.com/forbes/2010/0426/entertainment-fox-news-simon-schuster-glenn-beck-inc.html (accessed 10 April 2010). 47. “Beck said Gore using ‘same tactic’ in fight against global warming as Hitler did against Jews,” Media Matters for America, 1 May 2007, http://mediamatters.org/research/200705010003 (accessed 9 May 2010). 48. For other critical remarks about Sotomayor, see “Outrageous comments about Sotomayor,” Media Matters for America, 13 July 2009, http://mediamatters.org/research/200907130047 (accessed 9 May 2010). 49. 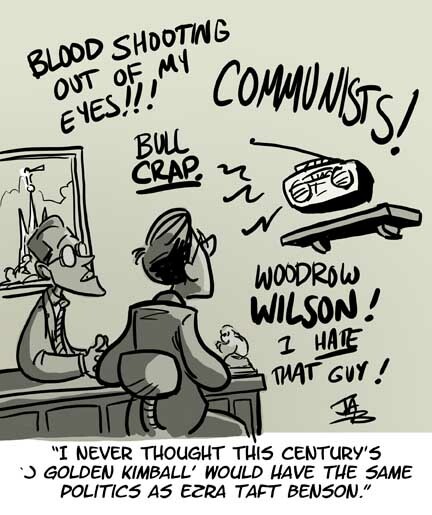 “Glenn Beck: Washington Vampires Out for Blood,” The Glenn Beck Program, 31 March 2010, http://www.glennbeck.com/content/articles/article/198/23380/ (accessed 9 May 2010). 50. See “The Most Outrageous Media Comments of 2009—Glenn Beck Takes the Cake,” http://www.alternet.org/media/144863/the_most_outrageous_media_comments_of_2009_–_glenn_beck_takes_the_cake?page=3 (accessed 20 March 2010). 51. “The Mormon Ethic of Civility,” The Church of Jesus Christ of Latter-day Saints Newsroom, 16 October 2009, http://www.newsroom.lds.org/ldsnewsroom/eng/commentary/the-mormon-ethic-of-civility (accessed 8 March 2010). 54. George Cobabe, “The White Horse Prophecy,” F.A.I.R., 2004, http://www.fairlds.org/pubs/whitehorse.pdf (accessed 19 April 2010). White_Horse_prophecy (accessed 14 March 2010). 56. Adam Reilly, “Latter Day Taint,” Boston Phoenix, 10 October 2009, http://thephoenix.com/boston/news/91016-latter-day-taint/ (accessed 8 March 2010). White_Horse_prophecy (accessed 20 March 2010). www.fairlds.org/pubs/whitehorse.pdf, (accessed 14 March 2010). The following statement is found on the Church’s official “Newsroom Blog”: “The so-called ‘White Horse Prophecy’ is based on accounts that have not been substantiated by historical research and is not embraced as Church doctrine”; http://newsroom.lds.org/blog/2010/01/church-statement-on-white-horse-prophecy-and-political-neutrality.html (accessed 19 April 2010). 59. “Glenn Beck: The Non-violence Pledge,” The Glenn Beck Program, http://www.glennbeck.com/content/articles/article/198/39574/ (accessed 27 April 2010). 61. David Neiwert, “The Glenn Beck Apocalypse Now Hour: Guest advises audience to buy farms, ‘take up arms’ to prepare for anarchy,” Crooks and Liars, 12 February 2010, http://crooksandliars.com/david-neiwert/glenn-beck-apocalypse-now-hour-guest (accessed 9 April 2010). tube.com/watch?v=U4NMoyarAM4, (accessed 21 May 2010). 64. David Neiwert, “Glenn Beck’s latest looming apocalypse: Iran,” Crooks and Liars, 10 February 2009, http://crooksandliars.com/david-neiwert/glenn-becks-latest-looming-apocalyps (accessed 21 May 2010). 65. David S. Bernstein, “New and improved Romney,” Boston Phoenix, 12 February 2009, http://thephoenix.com/Boston/news/96976-new-and-improved-romney/ (accessed 22 May 2010). 03/five-reasons-why-romneys-political-career-isnt-dead/38182/, (accessed 2 April 2010): “It’s ungrounded to assume that health care will be the Big Issue among Republican primary voters two years from now. If it’s not the biggest issue, or the second biggest issue, then it’s not really Romney’s problem.”. 67. Adam Reilly, “Latter Day Taint,” Boston Phoenix, http://thephoenix. com/boston/news/96976-new-and-improved-romney/?page=5#TOPCONTENT (accessed 8 March 2010). 506282.html (accessed 20 March 2010). 69. Dave Rosner, “Glenn Beck and Mitt Romney’s ‘Dirty Little Secret’” Political Mavens, http://politicalmavens.com/index.php/2009/11/02/beck-romneys-dirty-little-secret/ (accessed 29 March 2010). ?p=67 (accessed 5 April 2010). 71. “Show Recap—Mar. 5, 2010” The Glenn Beck Show, 5 March 2010, http://www.glennbeck.com/content/show/2010-03-05/ (accessed 29 Mar 2010). 72. “Having Tea at Harry’s (Reid) in Searchlight, NV,” The Las Vegas Glenn Beck Meetup Group, http://www.meetup.com/The-Las-Vegas-Glenn-Beck-Meetup-Group/calendar/11320830/ (accessed 2 April 2010). 73. See VegasVoter, “Glenn Beck Praises Nevada Republican Senate Candidate Danny Tarkanian,” Reid-B-Gone, 30 January 2010, http://www.reid-b-gone.com/?p=825 (accessed 2 April 2010). 74. “Glenn Beck Rooting Out Progressives,” PolitiFi, 27 April 2010, http://politifi.com/news/Glenn-Beck-Rooting-out-progressives-550440.html (accessed 8 May 2010). 75. “Robert F. Bennett,” New York Times, 10 May 2010, http://topics.nytimes.com/topics/reference/timestopics/people/b/robert_f_bennett/index. html (accessed 8 May 2010). tol/news/world/us_and_americas/article7121260.ece#cid=OTC-RSS&attr=797093, (accessed 9 May 2010). 77. “Robert F. Bennett,” New York Times, 10 May 2010, http://topics.nytimes.com/topics/reference/timestopics/people/b/robert_f_bennett/index.html (accessed 5 June 2010). 78. “The General Welfare,” Deseret News Church Section, 7 December 1934. I am indebted to Michael Quinn for this reference. 08/glenn-beck-urges-listeners-to-leave-churches-that-preach-social/ (accessed 12 March 2010). mmtv/201003110017 (accessed 9 May 2010). mesj/indexpage.htm (accessed 24 May 2010). 82. Jim Wallis, “An Open Letter to Glenn Beck: Social Justice and the Gospel,” Huffington Post, 11 March 2010, http://www.huffingtonpost.com/jim-wallis/an-open-letter-to-glenn-b_b_495716.html (accessed 13 March 2010). 83. Jim Wallis, “Biblical Social Justice and Glenn Beck,” Huffington Post, 11 March 2010, http://www.huffingtonpost.com/jim-wallis/biblical-social-justice-a_b_493875.html (accessed 13 March 2010). 12/us/12justice.html (accessed 24 May 2010). 85. Tobin Grant, “Glenn Beck ‘Leave Your Church’,” Christianity Today, 12 March 2010, http://www.christianitytoday.com/ct/2010/marchweb-only/20-51.0.html (accessed 14 March 2010). 2010/03/19/jim-wallis-loves-his-enemies-with-a-little-help-from-his-friends/ (accessed 19 March 2010). Joanna Brooks, in commenting on Beck’s threat against Wallis, said, “Glenn Beck is a Mormon. So am I. During the nineteenth century, my Mormon ancestors crossed the plains to live their faith without fear of attack from the mobs that had hounded them out of Missouri and Illinois. Watching Glenn Beck threaten to “bring the hammer down” on another person of faith makes my stomach turn. I could cite a host of scriptures from the Bible and the Book of Mormon about how Beck’s attack on Jim Wallis is not in keeping with faith-based values. Suffice it to say, Glenn Beck does not speak for the Mormons I know.” Joanna Brooks, “Bringing the Hammer Down: Glenn Beck Doesn’t Speak for the Mormons I Know,” Huffington Post, 19 March 2010 (accessed 24 May 2010). Mormon writer Jana Riess also challenged Beck’s understanding of Mormonism in “Glenn Beck Versus Social Justice,” at Beliefnet, http://www.beliefnet.com/Faiths/2010/03/Glenn-Beck-Versus-Social-Justice.aspx (accessed 19 March 2010). otterson/2010/04/political_not_theological.html (accessed 9 May 2010). to_beck.html (accessed 9 May 2010). 89. Amy Sullivan, “Why Does Glenn Beck Hate Jesus?”, Time, 14 March 2010, http://swampland.blogs.time.com/2010/03/14/why-does-glenn-beck-hate-jesus/#ixzz0jZqO5LQr (accessed 24 May 2010). 90. Peg Chemberlin, “Christians: ‘Run as Fast as You Can’ From the Church of Glenn Beck,” Huffington Post, 11 March 2010, http://www.huffingtonpost.com/peg-chemberlin/christians-run-as-fast-as_b_495166.html (accesed 28 March 2010). news.com/article/700016115/Mormons-other-Christians-decry-Glenn-Beck-comments-on-social-justice.html (accessed 19 March 2010). 92. “Glenn Beck: What Is ‘Social Justice’?” The Glenn Beck Program, 24 March 2010, http://www.glennbeck.com/content/articles/article/198/38320/ (accessed 8 May 2010). lewis-black-foxs-baboon-glenn-beck-has-nazi-tourettes-disease/ (accessed 4 June 2010). 36020.html#ixzz0mKD6qvZ4 (accessed 27 April 2010). mmtv/201004200020 (accessed 9 May 2010). bob-cesca/glenn-beck-the-televangel_b_546417.html (accessed 27 April 2010). 98. As quoted by Lacey Rose, “Glenn Beck Inc,” Forbes, 26 April 2010. http://www.forbes.com/forbes/2010/0426/entertainment-fox-news-simon-schuster-glenn-beck-inc_3.html (accessed 10 April 2010). 100. “I know that he exists,” http://www.americanpoems.com/; accessed 9 April 2010. 101. “You’re Being Set Up America,” Glenn Beck Program, 20 April 2010, http://www.glennbeck.com/content/articles/article/198/39360/ (accessed 9 May 2010). The transcript of this program on Beck’s website is a slightly edited version of what Beck actually said on the program, according to what I recorded on my television. 102. “Glenn Beck: Voter intimidation—Guess the Party,” Glenn Beck Program, 4 November 2008, http://www.glennbeck.com/content/articles/article/196/17704/ (accessed 9 May 2010). 77222/glenn-beck-at-cpac-progressivism-is-a-cancer-in-america (accessed 8 May 2010). 104. Doug Robinson, “Making a Better Glenn Beck,” Deseret News, 2 December 2007; www.deseretnews.com/article/1,5143,695232408,00.html (accessed 9 May 2010). 106. Spencer Magloff, “Glenn Beck Raked in $32 Million in 2009,” CBS News, 6 April 2010, http://www.cbsnews.com/8301-503544_162-20002064-503544.html (accessed 9 April 2010). 107. Joanna Brooks, “How Mormonism Built Glenn Beck,” Religion Dispatches, 7 October, 2009, http://www.religiondispatches.org/archive/politics/1885/how_mormonism_built_glenn_beck (accessed 8 March 2009). 109. “Glenn Beck Promotes Gold to Audience While Profiting from Gold Investment Firms,” Media Matters for America, 2 December 2009, http://mediamatters.org/research/200912020029 (accessed 6 June 2010). 110. “Glenn Beck Promotes Gold to Audience While Profiting from Gold Investment Firms,” Media Matters for America, 2 December 2009, http://mediamatters.org/research/200912020029 (accessed 5 June 2010). 111. Kenneth P. Vogel, “Rep. Anthony Weiner targets Glenn Beck and Goldline International,” 18 May 2010, http://www.politico.com/news/stories/0510/37413.html (accessed 5 June 2010). 112. See Glynnis MacNichol, “Glenn Beck Responds to Weiner’s Goldine Charges, Launches Weinerfacts.com,” Mediaite, 19 May 2010, http://www.mediaite.com/online/glenn-beck-responds-to-weiners-goldline-charges-launches-weinerfacts-com/ accessed 5 June 2010. 113. http://americaforever.com/; accessed 9 May 2010. This website has since gone offline for “unspeakable” reasons. -members-to-participate-in-us-census.html (accessed 9 May 2010). conference/talk/display/0,5232,23-1-1207-27,00.html (accessed 8 April 2010). Outstanding Dr. Rees. I am so encouraged by this type of clarity and reason. I hope our fellow faithful read and share this important work. Kathleen M. Lake, M.A. Brilliant work - a perspective that needed to be shared.